Books, we are told, are being eclipsed by hotter media. We like the stateliness of books. Seeking out self-sufficient homes on three continents, I have found one common thread: people live under their own power read books. One of my favorite questions is, "What books helped most?" Here is an annotated list of their answers, organized roughly into domains of interest: Energy, Tools, Shelter, Growing. Use your local library when you can. Buy only what you want for your family library, for gifting, and to support authors you value. If there is a good independent local book store near you, please support it in preference to huge predatory chains. Most of the clickable titles on our lists lead to Amazon.com, an on-line bookstore. Buying from Amazon through this page helps support the Solar Utilities Network. After almost a decade in print, my book in its two editions is surprisingly well loved. The 1993 edition was written quickly, as the off-the-grid movement emerged and ligitimized itself. It took two years to revise the book, and The New Independent Home is the book I wanted to write. This, its companion website, carries on the tradition, updates ther stories, and follows the trend, but the story is really best understood from the beginning: the printed book. To write and then revise my book, I did three things. For twenty years I built my own home using the best available technology (and as little money as possible.) Then I started visiting and revisiting friends living under their own power, from Vermont to Hawaii, Florida to Alaska. Finally, I spent almost two years working with a devoted editor (and independent homesteader) to make the book as good and complete a resource as it possibly could be. Along the road, I found that independent homesteaders enjoy the benefits of modern life to the fullest, while gaining immeasurably, not just from their nobler relationship to energy, but in the deep satisfaction which comes from being directly and creatively involved with living with Gaia. In my book, I take you to their homes, where they tell you their stories and we explore the ideas and technologies that make their lives work. "These are the people who actually do the things most of us only talk about, and we'll have far less fear of failure if we let their experiences show us the way." - Malcolm Wells, architect and author of The Earth-Sheltered House. Hope, Human and Wild: True Stories of Living Lightly on the Earth by Bill McKibben, is the hopeful sequel to his chilling book the End of Nature. David Ehrenfield, founding editor of Conservation Biology, sums it up: "Those who care about both the wild Earth and its civilized people will greet this book with joy. It shows that good things can come not only from planning, but unexpectedly - even arising out of devastation and evil. McKibben lets us understand that in this time of gathering environmental and cultural tragedy, hope is not only necessary, it is also reasonable." Confirming my suspicions, Rush Limbaugh endorses the author thusly: "He is an environmentalist wacko." My Dad gave me this book, saying "I need you to read this" and I say the same to you. Thank you, Dad. Beyond the Limits: Confronting Global Collapse, Envisioning a Sustainable Future by Donella H. Meadows, Dennis L. Meadows, Jorgen Randers is "essential reading for everybody who is concerned with the central issue of our times: how to achieve a transition to a sustainable global future" according to Gro Harlem Brundtland, former Prime Minister of Norway and present chairman of the World Commission of Environment and Development. The authors lay out the mathematical and conceptual rules by which the world game will be played whether we like it or not. For a striking visual look at the diversity and disequilibrium of wealth in the world, take a good look at Material World: A Global Family Portrait by Peter Menzel, Sandra Eisert (Photographer), Charles C. Mann. Somewhere between Texas and Tibet there must be a sustainable medium we can all enjoy! The Man Who Planted Trees by Jean Giono is a heartening fable about healing the earth one sapling at a time. Gaviotas: A Village to Reinvent the World by Alan Weisman tells the story of one small community in one of the world's most troubled countries that has found an answer that works. This is an exciting book, full of hope and pragmatism. Business and development are doubtless our next most glaring assaults on an innocent and fruitful planet. Lester Brown and Worldwatch colleagues Christopher Flavin and Sandra Postel wrote Saving the Planet: How to Shape an Environmentally Sustainable Global Economy in answer to the question, How can we create a vibrant world economy that does not destroy the ecosystem on which it is based. This important book answers the question meaningfully and well. Cars are our most glaring offense against nature. End of the Road: From World Car Crisis to Sustainable Transportation by Wolfgang Zuckermann, shows us how to get From World Car Crisis to Sustainable Transportation (the book's sub-title). Worldwatch's president Lester Brown says "No amount of minor readjustment will return [our transportation system] to working order; the system needs an overhaul... With End of the Road we now have a clear, comprehensive, and eminently readable manual for the overhaul..."
Hearts Open Wide: Midwives & Births by Susan Mazur & Pam Wellish tells the stories of mothers bringing their children into the world whole. Bringing children into the world is a potent political act, as well as every woman's (and aware man's) peak experience. This book helps us act more consciously. Raising children once we've brought them to the planet involves school. Micki and David Colfax explain how they raised their young without benefit of institutionalization in Homeschooling for Excellence. Finding & Buying Your Place in the Country by Les Scher, Carol Scher is the bible for land prospecting. The New York Times say "The book tells you everything." This book returns the landing process from nightmare back to the dream it ought to be. Outside Magazine notes that "The buyer's checklist alone is worth the cover price." To many folks say, after settling down and spending too much, 'if I'd only known!' This book helps you know ahead of time. Nature is organized in patterns, but humanity has not followed them very attentively in the last century or two. In A Pattern Language: Towns, Buildings, Construction, by Christopher Alexander, Sara Ishikawa, and Murray Silverstein looks like a heavy read, but it's so engaging I zipped right through ...and my perspective on how to think about development has been forever changed. This book looks at the way all the parts of development fit together in the service of humanity ...not the greed-heads who dominate us now. In his warm-up for the preceding book, Timeless Way of Building Christopher Alexander takes us back (and forward, we can hope) to times when building was earth-centered, honest, and enduring. If you like A Pattern Language then this book will please you, too. Is it possible to build a home without the bank owning it? This wonderful new book, Mortgage-Free! : Radical Strategies for Home Ownership by Rob Roy and illustrated by Malcolm Wells, tells exactly how to go about building without being beholden, and gives several examples of folks who have done it. My book is good for intelligent dreaming. Find out what successful homesteaders wish they'd thought of first. There's a good-sized excerpt of my book right here at the Solar Utilities Network site but I guarantee you won't be disappointed if you buy it. Here it is at the Amazon.com website. Okay: having found the land, studied the language of building, and gotten your money and energy under your own control ...how does YOUR house differ from everyone else's? John Connell's revised book Homing Instinct: Using Your Lifestyle to Design and Build Your Home is the book you need to tease those crucial but easily missed ideas from the corners of your mind -- and the minds of your family -- and into the design for your perfect home. Don't try to build a home without this book! Here is a brilliant explanation of why some buildings work well over time, and some do not. If you mean to build an ancestral home, one that nurtures and shelters you and your successors, you need to look closely at How Buildings Learn: What Happens After They're Built by Stewart Brand. This book should be required reading for anyone who wants to build. Of course nature starts dismantling the "built environment" the day the first spadeful is dug or nail is driven. By thinking about buildings as if they were intelligent -- what a great approach! -- we are enabled to make them smarter. The Rocky Mountain Institute publishes A Primer on Sustainable Building by Dianna Lopez Barnett and William D. Browning, which lays out simply and concisely the rationale for building sustainably. Abundant examples of successes. Inspirational. Even enemies of sensible building will learn something from this book. What happens when a scientist wakes up to the discovery that he's living in a denatured house? Well, if he's Dan Chiras, he sets out to build a proper house, and along the way writes a great book about the quest and the underlying discoveries along the way, and calls the book The Natural House: A Complete Guide to Healthy, Energy-Efficient, Environmental Homes. The Owner-Built Home by Ken Kern started the sensible-building revolution, and encouraged me to become a builder. Kern's common-sense approach to things like air circulation and doors made me realize that we better do things because they make sense, rather than because we've always done them "that way." Independent Builder: Designing & Building a House Your Own Way by Sam Clark carries on in the same tradition, and gives us a more modern perspective. Here are two regional books -- the ideas are best for northern tier states, especially New England -- that show how to use the sun as your furnace. 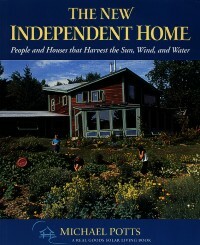 Each book has a strongly individualistic approach, reflecting the style of the authors, and both contain many good ideas which could easily be adapted for other styles and regions: The Passive Solar House by James Kachadorian and The Solar Home: How to Design and Build a House You Heat With the Sun by Mark Freeman. Architects Sketchbook of Underground Buildings: Drawings and Photographs by Malcolm Wells makes a good argument for leaving Nature on top, and building underneath. Energy-Efficient Houses published by Fine Homebuilding Magazine in their "Great Houses" series is fun to look at, although the builders of these manses suffered from Edifice Complex. You can certainly see that living energy efficiently doesn't prevent us from living graciously. I find a great deal of inspiration from the examples of brilliantly adaptive architectural solutions found all over the planet and drawn by John S. Taylor in his wonderful little book A Shelter Sketchbook: Timeless Building Solutions. Good ideas! You will surely find several you can adapt into your home. Straw bale building has become an intriguing example of an old building material rediscovered out of necessity. In California, for example, rice-growers can no longer burn the stalks, but we can build with them. There are many good questions about straw bale -- how many mountain passes can it be trucked across and still be sustainable? and where will the necessary thermal mass come from? But there is no question about whether straw is a wonderful building material, as can readily be seen in The Straw Bale House by Athena Swentzell Steen, Bill Steen, David Bainbridge, and David Eisenberg. Stories, explanations, and lovely pictures. If there's any doubt about the validity of building with Straw Bale, the companion volume dispells it. The Beauty of Straw Bale Homes by Athena and Bill Steen contains gorgeous pictures and a further abundance of good ideas, recipes for plaster and paint, and a wealth of details left out of their first book. This is a wonderful book! Rob Roy, who also wrote about building Mortgage-Free, shows off his favorite building strategy in Complete Book of Cordwood Masonry Housebuilding. This doesn't work in the desert, but in the woods, building with cordwood is an excellent, and seldom-considered, technique. The Sauna is another book by Rob Roy, and applies his cordwood technique to a special purpose. The author's personable, narrative style makes this a fun book to read even if you never want to build a cordwood sauna. Building is fun ...and you don't necessarily have to live there! Retreats: Handmade Hideaways to Refresh the Spirit by G. Lawson Drinkard and Lawson Drinkard. This little book might give someone a good start: Consumer Guide to Home Energy Savings (6th Ed): by Alex Wilson, John Morril, John Morrill. If you already have a house, and want to make it work better, this book shows you how: Eco-Renovation: The Ecological Home Improvement Guide by Edward Harland, illustrated by Duncan Roberts. Originally written for the British market, you will have to do a little translating, but the principles and ideas are sound and appropriate. Retrofitting for Energy Conservation: by William H. Clark gives another perspective on the same worthy work. Mel Moench's encyclopedic tome on reforming the way we think about our homes impresses me with its originality and thoroughness. Planet Earth Home takes a look at every -- and I mean EVERY -- aspect of home-making, from antibiotics to air circulation. Clearly, Mel has been thinking about homes and accumulating every relevant fact, for a long time! And he's not just an accumulator; he's been building ideal homes, and in the establishment's face (including jail time for non-compliance with local codes) ... and that makes him a hero in my eyes! If you want to look in-depth at the forces that shape homes on our planet, check this book out. The Real Goods Solar Living Sourcebook still contains many of my words about Independent Living, Land, Shelter, Harvesting Energy, and Computer Tools. It is a compendium of great possibilities as well as a shameless catalog of solar schlock. Paul Gipe's Wind Power for Home & Business: Renewable Energy for the 1990s and Beyond is the authoritative resource for america's most abundant renewable energy source. Paul has written a slimmer, simpler book about Wind Power for those who want to know the basics. Fittingly, it's called Wind Energy Basics: A Guide to Small and Micro Wind Systems. Renewable energy is at the heart of the sustainable home. Steven Strong's The Solar Electric House: Energy for the Environmentally-Responsive, Energy-Independent Home gives you a solar architect's perspective on the electromechanical reality you'll need to master. Written with a more of a west-coast slant, and by an engineer, The New Solar Electric Home: The Photovoltaics How-To Handbook by Joel Davidson is another excellent book about the nuts and bolts of solar electricity. The Fuel Savers: A Kit of Solar Ideas for Your Home, Apartment, or Business edited by Bruce Anderson, provides a good starting place. Consumer Guide to Solar Energy: Easy and Inexpensive Applications for Solar Energy by Scott Sklar and Kenneth G. Sheinkopf covers some of the same territory but from a different angle. Eliot Coleman has added immeasurably to the wisdom with which we grow our food. In his original work, now thankfully back in print, The New Organic Grower: A Master's Manual of Tools and Techniques for the Home and Market Gardener, he (with help from illustrators Sheri Amsel and Molly Cook Field) tell us how to garden successfully. In the companion volume, Four-Season Harvest: How to Harvest Fresh Organic Vegetables from Your Home Garden All Year Long Eliot Coleman is joined by Barbara Damrosch to demonstrate techniques for extending the growing season. These are beautiful books which will pay for themselves in a single growing season. Passport to Gardening is a wonderfully encyclopedic book that will help any gardener improve the yield and beauty of the garden. This book has an northeastern flavor although it has plenty of information for any gardener. On the west coast -- the RIGHT coast, as we solar-oriented folks see it -- the best gardening book is Sunset's masterful Western Garden Book. Because there are so many variables in the west, this book's most important contribution is the careful attention paid to growing zones -- no less than 24 are identified in the newest edition. Permaculture: A Designers' Manual by Bill Mollison is a more technical approach for those of us who want to get serious about planting for the ages. Patrick Whitfield has written a very approachable little book on the subject, appropriately titled Permaculture in a Nutshell. Gene Logsdon manages to inform me while making me laugh (and, sometimes, flinch.) These two books have helped me understand the common-sense aspects of agriculture. In The Contrary Farmer Gene makes his confession about using his wits instead of doing it conventionally. Then Logsdon issues a challenge: The Contrary Farmer's Invitation to Gardening shows us all how to grow our food, and made me wonder why I didn't start doing so much earlier. Finally Logsdon rounds out the conversation with his thoughtful and provocative Living at Nature's Pace. We'd all be so much better off if we'd pay heed to the curmudgeonly Logsdon! Cooking With the Sun: How to Build and Use Solar Cookers by Beth and Dan Halacy is a delightful culmination to the cycle. The sun nurtures us and the food we eat; why not use it to cook with, too? Joseph Radabaugh adds a delicious little book to this conversation: Heaven's Flame: A Guide to Solar Cookers provides very thorough instructions for building your own or advice when selecting a commercial model. More than any other act, I think, testifies to our commitment to living sustainably than using the sun for cooking. This book is an encyclopedia of good food sense: Whole Foods Companion: A Guide for Adventurous Cooks, Curious Shoppers, and Lovers of Natural Foods by Dianne Onstad. It should grace every kitchen. Regime change begins at home. Participate! copyright © 1993-2005 Solar Utilities Network. All Rights Reserved.